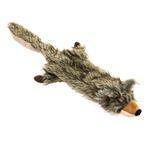 Curb your dog's craving for bringing home a critter to play with, with the Zanies Unstuffies Critter Dog Toy in Coyote! Dogs will love to shake, toss, and tug this Coyote Zanies Unstuffies Critters Dog Toy, while owners will love that there’s no stuffing mess to clean up after! 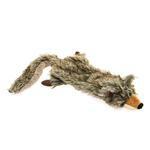 Turn the tables and have your pup be the predator with this Coyote unstuffed animal. The plush material is soft and is great for tugging, tossing, and even cuddling with. The floppy style of this plush toy makes it easy to carry and the many appendages make it easy for you to find a dry spot for a less slimy game of fetch. This is a great toy that suits pets of most sizes since it is skinny, lightweight, yet substantial. Made of soft faux fur plush material and two squeakers. Zanies dog toys are made of quality new materials. Always supervise pets and replace torn or worn toys. Posted On 07/18/18 by tami l from Parker, CO Yes, tami l recommends this product! I purchased this for my son's 85 pd Shepard/Rottweiler. We have had it for over 3 weeks. Normally he would have the squeakers torn out of the critter. This has held up extremely well. Total would recommend this product. This has to be the worst toy I have ever bought from Baxter Boo!!! The 2 squeakers did NOT LAST 24 HOURS!!!! BOTH LOST THEIR SQUEAK!!! I have a 20lb DACHSHUND, not a Wolf!!! So- He lost interest in his "Birthday toy" within 1 day because their was no more squeaks!!! He hardly played with it!!! What's wrong with the quality of these dog toys??? VERY DISAPPOINTED!!!! SO WAS MY DOXIE!!! Posted On 06/16/16 by LL from , CA Yes, LL recommends this product! My dog loves the Zanies Coyote, especially when chomping the belly and it squeaks. Posted On 12/28/15 by Cathy A from Buffalo, NY Yes, Cathy A recommends this product! By far one of my dog's favorite toys. She carries it everywhere & shares it will anyone who will pay attention to her. Posted On 12/07/15 by Kate S from , Yes, Kate S recommends this product! our dog enjoys Zanies Unstuffies Critter Toys. This one is larger than I had expected. Has two squeakies. We have a small dog and she will get many hours of fun chasing and shaking this Coyote. Posted On 08/13/15 by Christine S from , OH Yes, Christine S recommends this product! Posted On 06/05/15 by Sandee L from Bullhead City, AZ Yes, Sandee L recommends this product!